I realize that I have probably missed my mark with this post, it should’ve gone up last week since everyone celebrated Saint Patrick’s Day yesterday, but I’m hoping that there are other procrastinators out there in the world who will be able to enjoy these on the real St. Patty’s Day next week. There will be no celebrations from this girl though. I received some devastating news this morning regarding a very close friend of mine. 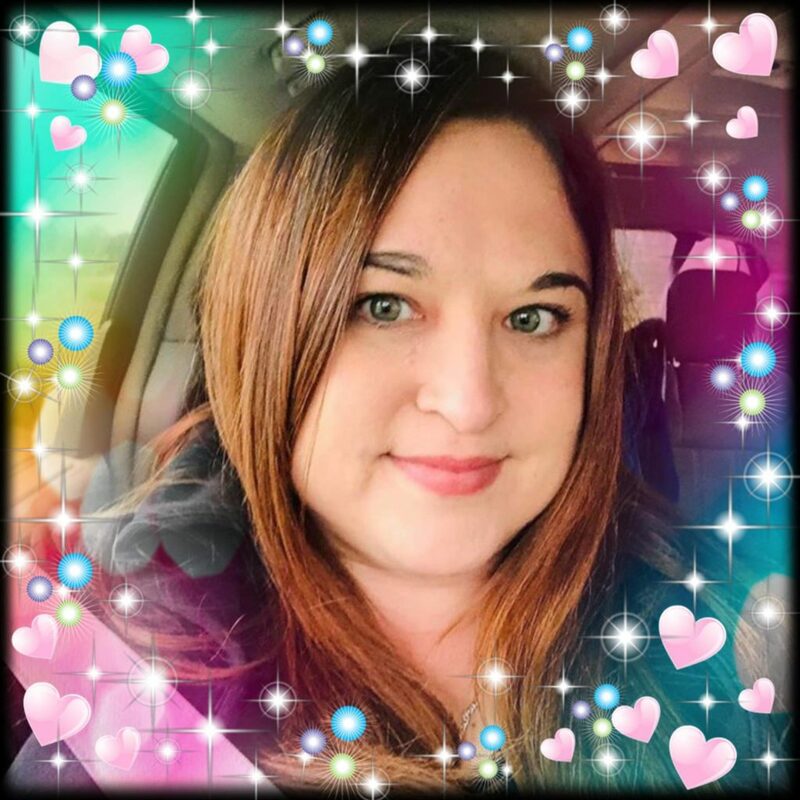 Tomorrow I’m making an unexpected trip back to Charleston and, although I absolutely adore going home and spending time with my family, this visit will be more about offering my love and support to a loved one in mourning. Honestly, today’s recipe couldn’t be more fitting for the one we lost. 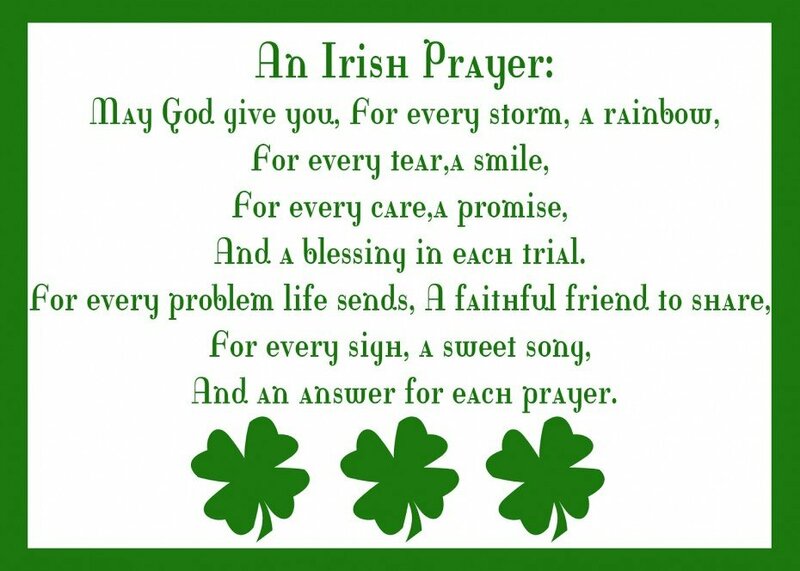 Will you please raise your glasses with me as I offer this prayer of comfort for my friend? 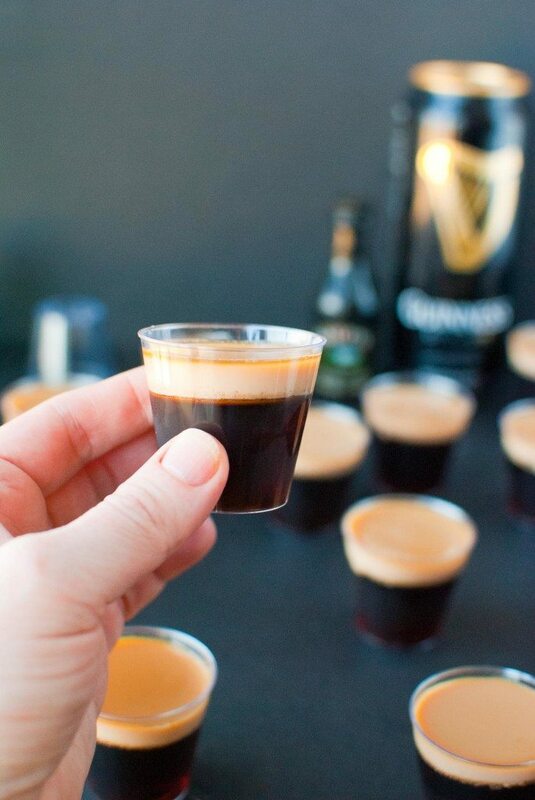 The combination of Bailey's Irish Cream, Guinness stout, coffee and chocolate are blended together to make this Baby Guinness Jello shot which is perfect for Saint's Patrick Day. Add Guinness to a medium bowl, sprinkle on both envelopes of gelatin, and allow to sit for one minute. Stir in Patron, creme de cacao and hot water until the gelatin is completely dissolved. 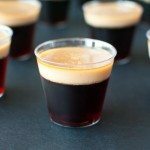 Evenly divide the chocolate Guinness jello shot mixture into individual shot glass cups and refrigerate immediately for 15-20 minutes. NOTE: Mine made exactly 15. Once the Guinness portion has chilled, add the Bailey's Irish Cream to a medium bowl, sprinkle on the packet of gelatin, and allow to sit for one minute. Pour hot water into the Bailey's jello shot mixture and stir until the gelatin is completely dissolved. Gently pour the Bailey's jello shot mixture over the chilled Guinness mixture. Refrigerate for 3 hours or until completely set. Yeah! This is my kind of jello shot! 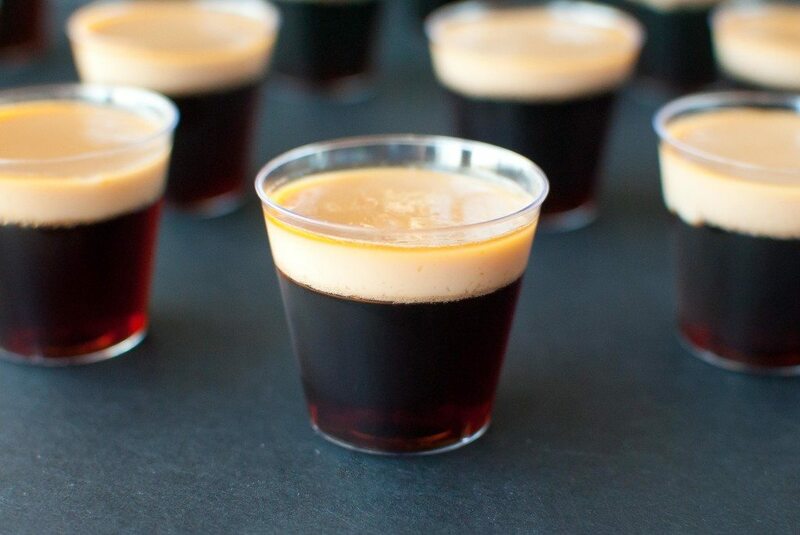 We do Baby Guinness shots too, but use Cafe Padron (coffee + tequila) and Baileys. My favorite shot in the world! Thanks, Jaden! 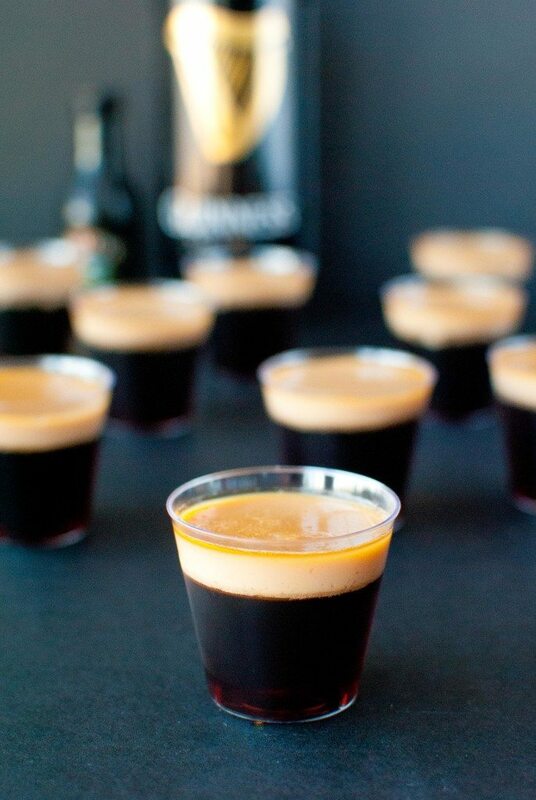 I can’t really use too much coffee tequila in my Baby Guinness shots any more. It used to be our fav too. My husband and I had to slam like 4 each back to back at 6am on our honeymoon because we couldn’t put open liquor bottles in our bag when we went from Oahu to Maui. I was fine with it, but my husband? Yeah…not so much! He doesn’t even really like to think about them any more. Ha! When you say envelopes of gelatin, do you mean a 3.5 of box? Hi, Rene! The gelatin I used had small envelopes inside of it. One envelope is about 2 1/2 tsp of gelatine. Hope this helps! Hi Amber I Saw your recipe and had to make them for my St. Paddy Day party. They were a hit everyone loved them!! I’m sure I’ll be asked to make these again. Yaaaaaaaaay!!! So glad they were a hit! Thanks for letting me know! haha. Amber it’s never to late for a jello shot. Hilarious. Thanks for sharing! Love Guinness shots, but have not paired with Bailey’s. So fun and love the colour contrast. They’re soooo good! Can’t wait for you to try them! Oh I am very sorry about your friend, I hope you have some wonderful memories now that some time has passed. 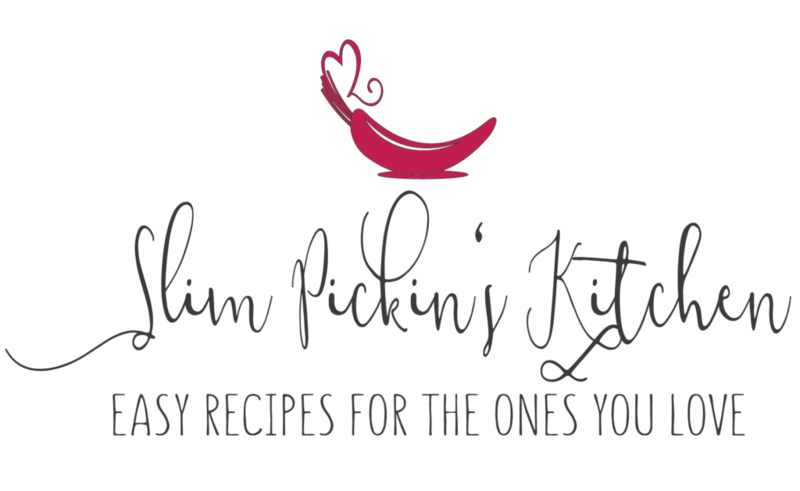 These sound like awesome shots…..my aunt makes vodka jelly shots every year for Christmas and they are POTENT I tell you….I have to say I love the sound of these with the Baileys and coffee….. Thanks so much, and please let me know if your friend tries them! You really can’t taste the beer all that much! The coffee flavor of the vodka/patron takes it away. It tastes more like a Bailey’s & Coffee. How far in advance do you think I could make these? Today is Wednesday and I need them for Sunday. I would have lids on the shot cups. Thank you! Can’t wait to try! Hey, Jennifer! The top layer w/ the Baileys tends to get a dark skin on it if you let them sit for too long. If you press a tiny bit of cling wrap on the surface of them (like you would when making homemade pudding) then cover them w/ lids that may prevent the skin from forming, and I would think you could make these on Friday so they’d be good for Sunday. You could also make the Guinness part of them today then save the Bailey’s portion until Friday. Awesome. I was just going to ask if I even get the Guinness part of it ready sooner rather than later so then I could do what you specified. So excited!! I could even do the Bailey’s Sunday morning to have them ready for the afternoon. I already shared with a girlfriend!